Crisp and juicy, cucumbers are the basis of a good pickle, but they are also commonly eaten raw. 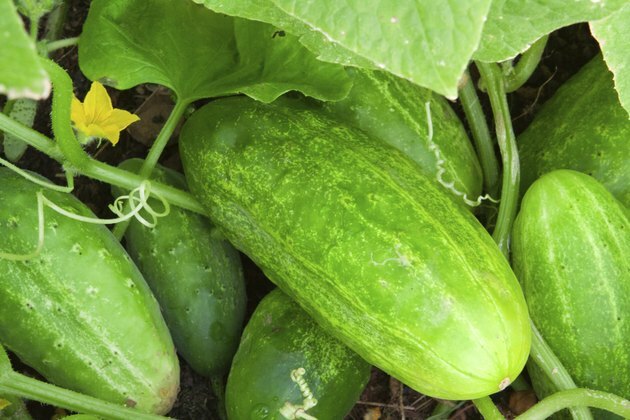 A warm weather vegetable, cucumbers have a refreshing taste and can be easily added to sandwiches or salads to provide extra nutrition and a crunchy texture. Cucumbers are low in calories and rich in a number of nutrients, making them an excellent nutritional choice. Cucumbers are most commonly eaten raw, unless they are prepared as pickles. Low in calories, a half-cup serving of raw, sliced cucumber with the peel on contains only 8 calories per serving. With only 0.06 grams of total fat per serving, and less than 1 gram of sugar, cucumbers are a nutritious choice, especially considering that they also contain almost half a gram of dietary fiber per half cup serving. Dietary fiber is essential for slowing down your body's digestion of food, giving your system enough time to absorb essential nutrients. Cucumber is rich in a number of essential vitamins, including vitamin K, also known as the clotting vitamin. Vitamin K is essential for helping your blood clot, and the recommended daily amount is 90 micrograms for adults over the age of 19. A half cup serving of sliced raw cucumber contains 8.5 micrograms of vitamin K, almost 10 percent of the RDA for adults. A half-cup serving of sliced cucumber also contains 4 micrograms of folate, 55 international units of vitamin A and 1.5 milligrams of vitamin C.
Cucumbers are a rich source of a number of minerals. A half-cup serving of sliced cucumber also contains 12 milligrams of phosphorus, 7 milligrams of magnesium, and 8 milligrams of calcium. Cucumbers are also rich in potassium, containing 76 milligrams per half cup serving of sliced cucumbers. An electrolyte, potassium helps your body conduct electricity and is essential to smooth muscle movement and regular, healthy digestive processes. Potassium also helps regulate the amount of sodium in your blood, helping you keep your sodium levels low and thus lowering your risk of developing high blood pressure and other cardiovascular complications. For adult men and women, including pregnant women, the recommended dietary allowance is 4.7 grams per day. For breastfeeding women, the RDA rises to 5.1 grams per day. Water is essential for all bodily functions and your overall health. While there is no recommended daily intake, the general advice from experts is to consume between six and eight 8-ounce glasses of water each day. More water may be required because of high temperature and humidity, or if you are participating in strenuous physical activity. A half-cup serving of raw, sliced cucumbers contains almost 50 grams of water per serving. Your daily water intake can be achieved through diet — especially eating water-rich foods such as cucumber — and through drinking fluids such as juices, teas and water.